Envision some of the greatest joys of childhood: the cold weight of a frog sitting in the palm of your hand; the thrilling drop in your mid section as a roller coaster takes the plunge; the summer heat beating down on your back as you study the iridescent eyes of a dragonfly. Now imagine how impoverished childhood would be without these experiences. That’s the background of the children whose lives are enriched by programs offered through The University of Scranton’s Leahy Community Health and Family Center (LCHFC). 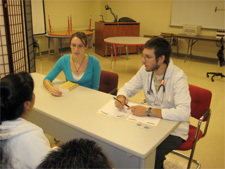 The Center was dedicated in 2003 to identify and meet the health and wellness needs of underserved people in the greater Scranton community – children and families, senior citizens, the homeless and the uninsured – and also to provide a place where faculty could guide students in practical educational experiences. 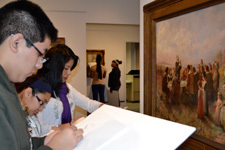 The University of Success is a pre-college program designed to provide academic, social, and cultural enrichment and experiences to high school students. The ultimate goal of this program is to assist participating students to successfully complete high school and gain entrance into a college or university. Think for a moment how you would cope without running water, a means to cook or even a refrigerator. That’s the plight of the homeless people who seek assistance from the LCHFC’s Alice V. Leahy Food and Clothing Pantry. The food and clothing pantry is a student-run effort to provide homeless and at-risk people with the dignity of clean, decent clothing and the most basic of human needs – their daily bread. 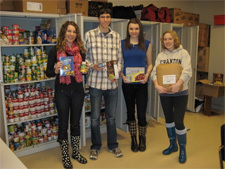 University of Scranton students often assist people who come to the pantry after accessing the health clinic. Consider the peace of mind provided by health insurance, which opens the door to caring and professional primary care to cure illness, prevent disease and manage chronic conditions. The Edward R. Leahy, Jr. Center Clinic for the Uninsured was founded to be there for those who lack this most basic necessity. Since its opening, the clinic has provided care to thousands who otherwise would be forced to use expensive emergency room care or do without medical attention altogether. The Edward R. Leahy, Jr. Center Clinic for the Uninsured is open Thursdays, from 2 to 6 p.m. Physical therapy and counseling are offered on Wednesdays by appointment only. In addition to these initiatives, the LCHFC also offers a “Peacemakers After School” program for children between the ages of 9 and 13 and a “Growing Stronger” program for area senior citizens, as well as numerous educational programs, health fairs and special clinics offered throughout the year.